by Alain Ambrosi and Nancy Thede, Barcelona, April 20, 2017. The pro-independence government of Catalonia recently sparked a political crisis in Spain by proposing to call a referendum on independence by the end of 2017 with or without the approval of the central government. In contrast, “Catalonia in common” defines itself as an innovative political space of the Catalan left. Initiated by Barcelona in Comú a little less than a year after its election to city hall, ​​the initiave was launched in October 2016. A short manifesto explained its raison-d’être and presented an “ideario politico” (a political project) of some 100 pages for broad discussion over 5 months which culminated in a constituent assembly last April 8. We interviewed Joan Subirats a few days after the Constituent Assembly of Catalunya en Comú took place. Joan is an academic renowned for his publications and his political engagement. 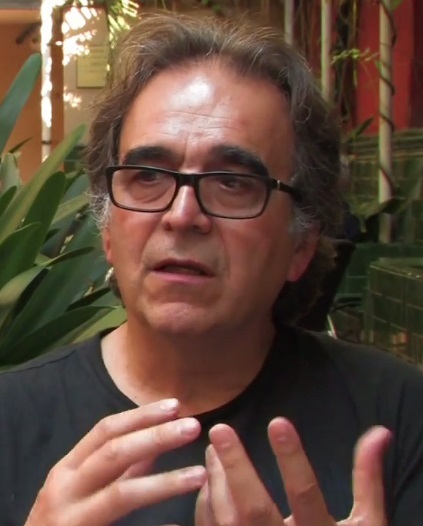 A specialist in public policy and urban issues, he has published widely on the Commons and on the new municipalism. He is one of the artisans of Barcelona in Comú and has just been elected to the coordinating body of the new space named recently “Catalunya en comú”. NT — Tell us about the trajectory of the development of this new initiative: a lot of people link it to the 15-M, but I imagine that it was more complex than that and started long before. JS — At the outset there was Guanyem, which was in fact the beginning of Barcelona en Comú: the first meetings were in February-March 2014. Who was involved? this is quite simultaneous with the decision by Podemos to compete in the European Parliament elections in May 2014. Podemos organises in February 2014; Guanyem begins organising in February- March 2014 to compete in the municipal elections of May 2015. Going farther back, there is a phase of intense social mobilisation against austerity policies between 2011 and 2013. If we look at the statistics of the Ministry of the Interior on the number of demonstrations, it is impressive, there were never as many demonstrations as during that period, but after mid-2013 they start to taper off. There is a feeling that there are limits and that demonstrations can’t obtain the desired changes in a situation where the right-wing Popular Party (PP) holds an absolute majority. So the debate emerges within the social movements as to whether it’s a good idea to attempt to move into the institutions. Podemos chooses the most accessible scenario, that of the European elections, because these elections have a single circonscription, so all of Spain is a single riding, with a very high level of proportionality, so with few votes you get high representation because there are 60-some seats, so with one million votes they obtained 5 seats. And people vote more freely in these elections because apparently the stakes are not very high, so they are elections that are good for testing strategies. In contrast, here in Barcelona, we chose the municipal elections as the central target because here there is a long history of municipalism. So this sets the stage for the period that began in 2014 with Guanyem and Podemos and the European elections and in May 2015 with the municipal elections where in 4 of the 5 major cities – Barcelona, Madrid, Valencia and Zaragoza – alternative coalitions win that are not linked to either of the two major political parties (PP and the Socialist Party – PSOE) that have dominated the national political scene since the return to democracy in 1977. And in the autonomous elections, a new political cycle also begins, in which we still are. If we go farther back, to 2011 – there are a couple of maps that show the correlation between the occupation of plazas in the 15-M with the number of alternative citizen canadidacies at the municipal level. So Podemos and all the alternative citizen coalitions all refer to the 15M as their founding moment. But the 15M is not a movement, it was a moment, an event. You must have heard the joke about the stranger who arrives and wants to talk to the 15M – but there is no 15M, it has no spokespersons and no address. But everyone considers it very important because it transformed the political scene in its wake . But what was there before the 15M? First the anti-globalisation movement, the oldest one, very interesting because a large number of the new political leaders have come out of it, with forms of political mobilisation different from the traditional ones. Then there was the « Free Culture Forum » linked to issues regarding internet which was very important here in Barcelona – with Simona Levy and Gala Pin, who is now a municipal councillor – that is important because here digital culture, network culture, was present from the very beginning, something that didn’t occur in other places. The third movement was the PAH (Platform for People Affected by Mortgages) which emerges in 2009 and had precedents with Ada Colau and others who organised « V for vivienda » (like the film « V for vendetta », but in this case vivienda – housing), an attempt to demonstrate that young people were excluded from social emancipation because they didn’t have access to housing. Their slogan was « you’ll never have a house in your whole f’king life ». And the forms of mobilisation were also very new, for example, they occupied IKEA because at that time IKEA’s advertising slogan was « the independent republic of your home », so they occupied it and slept in the beds there. So this was more youthful, alternative, more of a rupture, but then in 2009 with the creation of the PAH they started to try to connect with the immigrant sector and people who were losing their houses because of the mortgage hype, it was very important because it’s the movement that tries to connect with sectors outside of youth: the poor, immigrants, working class… with the slogan ‘this is not a crisis, it’s a sting’. So the PAH is very important because it’s the movement that connects with sectors of the population outside of youth: workers, immigrants, the elderly… For example, here in Plaza Catalunya in 2011 the only major poster rallying people who weren’t youth was that of the PAH. And the fourth movement – the most ‘authentic’ 15M one – was that of the « Youth without future ». People who organised mainly in Madrid, typical middle-class university sector with post-grad studies, who suddenly realised that they wouldn’t find jobs, that it wasn’t true that their diplomas would open doors for them, they were in a precarious situation. So those were the four major currents that converged in the basis of the 15M. But what made it ‘click’ was not just those 4 trends, but the fact that huge numbers of other people recognised the moment and converged on the plazas and overwhelmed the movements that started it. The most surprising thing about the moment was that those 4 movements – that were not all that important – were rapidly overwhelmed by success of the movement they started and new people who spontaneously joined. That was what really created the phenomenon, because if it had been just those 4 movements, if it had been like ‘Nuit debout’ in Paris where people occupied the plaza but without the sensation that people had steamrollered the leaders. So, when the plazas are evacuated, the idea becomes ‘Let’s go to the neighbourhoods’. So all of a sudden, in the neighbourhoods of Barcelona and Madrid, assemblies were organised where there was a mixture of the old neighbourhood associations that were no longer very active and whose members were older (my generation) and new people who brought new issues like ecology, energy, bicycle transport, cooperatives, water and a thousand different things and who created new spaces of articulation where people who had never thought that they would meet in the neighbourhoods began to converge. I think this explains the re-emergence of municipalism that followed: people begin to see the city as a place where diverse social changes can be articulated on a territorial basis: many mobilisations are taking place in isolation, in a parallel manner and don’t have a common meeting-point. Water as a common good, energy transition, sustainable transport, public health, public space, infant education… All of a sudden there was something that brought people together which was to discuss the city, the city we want – David Harvey mentions in an article that the modern-day factory is the city. That is, we no longer have factories, the city is now the space where conflicts appear and where daily life becomes politicised: issues like care, food, schooling, transport, energy costs – and this creates a new space for articulating these issues that hadn’t been previously envisaged. So I think this is the connection : 15-M as a moment of overwhelming, the end of a cycle of mobilisation – remember that there had been a petition of a million and a half signatures to change the mortgage legislation, that Ada Colau presented in the national Congress, where she accused the PP deputies of being assassins because of what they were doing – but that mobilisation had no effect in the law. A PP deputy declared ‘If these people want to change things, then they should get elected’. So people started thinking ‘OK, if that’s the way it is, then let’s get ourselves elected’. This is the initial change of cycle in 2014. So the 4 movements were present in the meetings of Guanyem and BComun, as well as some progressive intellectuals and people from other issue areas like water, transport, energy etc. 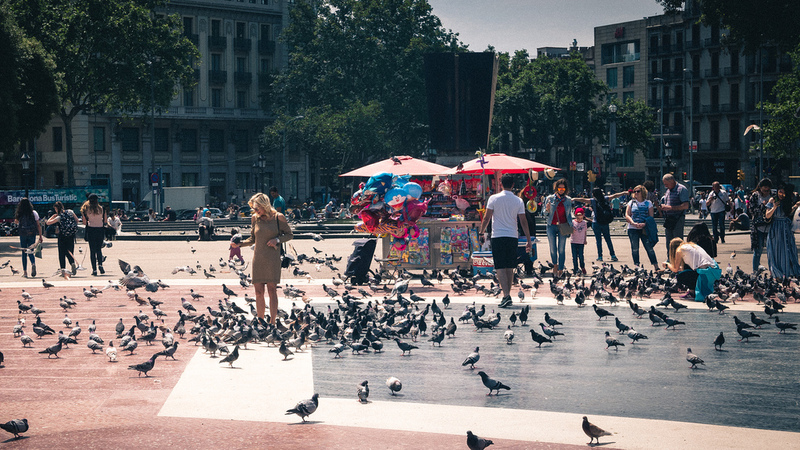 That was the initial nucleus here in Barcelona – in Madrid it was different. There the Podemos generation had a different logic. Here, from the beginning, we wanted to create a movement from the bottom up and to avoid a logic of coalition of political parties, this was very clear from the outset. We didn’t want to reconstruct the left on the basis of an agreement amongst parties. We wanted to build a citizen movement that could impose its own conditions on the parties. In the case of Podemos it was different: it was a logic of a strike from above – they wanted to create a strong close-knit group with a lot of ideas in a very short period and as a result an electoral war machine that can assault the heavens and take power. Here, on the other hand, we foresaw a longer process of construction of a movement where we would start with the municipalities and after that, we’ll see. moralisation of politics. Here the main points are non-repetition of mandates, limits on salaries of elected officials, anti-corruption and transparency measures, etc. So we presented this in June 2014 and we decided that we would give ourselves until September to collect 30,000 signatures in support of the manifesto and if we succeeded, we would present candidates in the municipal elections. In one month we managed to get the 30,000 signatures! Besides getting the signatures on internet and in person, we held a lot of meetings in the neighbourhoods to present the manifesto – we held about 30 or 40 meetings like that, some of them small, some more massive, where we went to the neighbourhoods and we said « We thought of this, what do you think? We thought of these priorities, etc’. » So, in September of 2014 we decided to go ahead; once we decided that we would present a slate, we began to discuss with the parties – but with the strength of all that support of 30,000 people backing us at the grassroots, so our negotiating strength with respect to the parties was very different. In Dec 2014 we agreed with the parties to create Barcelona en Comun – we wanted to call it Guanyem but someone else had already registered the name, so there was a lot of discussion about a new name, there were various proposals: Revolucion democratica, primaria democratica, the term Comu – it seemed interesting because it connected with the Commons movement, the idea of the public which is not restricted to the institutional and that was key. It was also important that in the previous municipal elections in 2011 only 52% of people had voted, in the poorer neighbourhoods a higher number of people abstained and that it was in the wealthier neighbourhoods where a larger proportion of people had voted. So we wanted to raise participation by 10% in the poor neighbourhoods more affected by the crisis and we thought that would allow us to win. And that was what happened. In 2015, 63% voted, but in the poor areas 40% more people voted. In the rich areas, the same people voted as before. So it was not impossible to think we could win. And from the beginning the idea was to win. We did not build this machine in order to participate, we built it in order to win. We didn’t want to be the opposition, we wanted to govern. And as a result, it was close, because we won 11 of 41 seats, but got the most votes so we head the municipal council, the space existed. From the moment Guanyem was created in June 2014, other similar movements began to be created all over Spain – in Galicia, in Andalucia, in Valencia, Zaragoza, Madrid… One of the advantages we have in Barcelona is that we have Ada Colau, which is a huge advantage, because a key thing is to have an uncontested leader who can articulate all the segments of the movement – ecologists, health workers, education professionals…. If you don’t have that it’s very difficult, and also the sole presence of Ada Colau explains many things. In Madrid they found Manuela Carmena, who is great as an anti-franquista symbol, with her judicial expertise, very popular but who didn’t have that tradition of articulating movements, and as a result now they are having a lot more problems of political coordination than here. AA — So now Catalunya en comu defines itself as a new political space on the left for the whole of Catalonia. But in recent Catalan history that’s nothing really new: there have been numerous political coalitions on the left, such as the PSUC in 1936 followed by many others. So what is different about this initiative? JS — If we open up our perspective and look at things more globally, I think that what justifies the idea that this is a new political space is the fact that the moment is new, we’re in a new phase so it’s very important to understand that if this new political moment reproduces the models and the conceptual paradigms of the old left and of the Fordism of the end of the 20th century, we won’t have moved ahead at all. The crisis of social democracy is also a crisis of a way of understanding social transformation with codes that no longer exist. As a result the measure of success of this new political space is not so much in to what extent it can bring together diverse political forces, but rather its capacity to understand this new scenario we find ourselves in – a scenario where digital transformation is changing everything, where we no longer know what ‘labour’ is, where heterogeneity and social diversity appear as factors not of complexity but of values, where the structure of age no longer functions as it used to – where everything is in transformation, so we can no longer continue to apply ideas – to use a phrase coined by Ulrich Beck – ‘zombie concepts’, living dead, no?, we forge ahead with our backpacks full of 20th-century concepts, applying them to realities that no longer have anything to do with them. It’s easy to see the defects of the old, traditional concepts, but it’s very difficult to construct new ones because we don’t really know what is happening nor where we are headed. The example of the debate in France between Valls and Hamon – at least, I read the summary in Le Monde, where Valls maintained that it would be possible to come back to a situation of full employment and Hamon said that is impossible, that it’s necessary to work towards the universal basic income; in the end, Hamon is closer to the truth than Valls, but Hamon isn’t capable of explaining it in a credible way – and it is very difficult to explain it in a credible way. Here, we are working at one and the same time on the Commons and the non-institutional public sphere, we are demanding greater presence of the public administration when probably it wouldn’t really be necessary, but since we don’t have a clear idea of how to construct this new thing, we are still acting sort of like slaves of the old. So that’s where I think the concept of the Commons, of the cooperative, the collaborative, new ideas regarding the digital economy, are more difficult to structure, because we’re also conscious that capitalism is no longer only industrial or financial but now it’s digital capitalism, and it controls all the networks of data transmission and at the same time the data themselves, probably the wealth of the future. So, sure we can do really interesting things in Barcelona, out of Barcelona en Comun, but we have GAFAM (Google, Apple, Facebook, Amazon and Microsoft), and GAFAM has its own logics and that complicates things. So we have to create a new political subject – and it’s obvious that we need something new – but what isn’t so obvious is what are the concepts we need to create this new subject. So if you look at the documents published by Un Pais en Comu that’s what you’ll see: a bit of different language, a different way of using concepts, but at the same time a trace of the heritage of the traditional left. The journal ‘Nous Horitzons’ has just published a new issue on ‘Politics in Common’ which brings together a lot of these elements. The impression that some of us had in the assembly the other day in Vall d’Hebron (the inaugural assembly of the movement) was that the old ways were still weighing us down, that there was a difficulty to generate an innovative dynamic. NT — That was clear in the composition of the audience. JS — Yes, well, the Podemos people weren’t there, of course… they didn’t come for various reasons, because probably not everybody was in agreement with Albano-Dante but they saw there was a lot of disagreement and so they preferred not to come, and that’s a type of public that, as well as filling the hall, also changes the type of dynamic – so it was more the traditional-style organisations that were there (Iniciativa or EUIA), there was more of the old than the new probably. Perhaps that’s inevitable, but what we have to do now is to see if we can change that dynamic. JS — Yes, but when you go to Latin America and you talk about that, it all revolves around the State. But here, we try not to be state-centric. We are trying to avoid the idea that the only possible transformation needs to depend on the State. JS — Yes, there’s a margin there: the resilience of the new politics depends more on the capacity to create ‘muscled’ collective spaces – public, collective, common – than on the occupation of the institutions. But without the occupation of the institutions, it’s very difficult to construct those spaces. The example that comes to mind for me is from Copenhagen: there it was the cooperatives of the workers’ unions that built the big housing coops that exist now; also, the municipal government when the left was in power built a lot of public housing; then when a right-wing government came to power, it privatised all the public housing but it couldn’t privatise the cooperatives. So in the end, things that are strictly state-based are more vulnerable than when you build collective strength. So if we are able to benefit from these spaces in order to build ‘collective muscle’, using our presence in the institutions, this will end up being more resilient, more stable over time than if we put all our eggs in the State basket. So the Barcelona city government has civic social centres that are municipal property, but what is important is to succeed in ensuring that these centres are controlled by the community, that each community make them its own despite the fact that the property is officially that of the municipality, but they must be managed through a process of community management. So you need to build in the community a process of appropriation of institutions that ends up being stronger than if it were all in the hands of the State. Now we are discussing citizen heritage, how the city government can use its property – houses, buildings – and it can cede them for a certain period in order to construct collective spaces. For example, 8 building sites that belong to the municipality have been put up for auction on 100-year leases for community organisations to build housing cooperatives. This doesn’t take property away from the public sphere and at the same time it generates collective strength. But a certain sector of the political left here, the CUP, criticises this as privatisation of public space. They think Barcelona en Comun should build public housing instead, state-owned housing. That’s a big difference. And people are aware of that, but at the same time there are doubts about whether this makes sense, whether there is sufficient strength within the community so that this can work. Or, for example, the most common criticism is that “you have an idea of the public, the collective, the Commons, that implies capacities in the community that are only present in the middle classes that have the knowledge, the organisational capacity… so it’s a very elitist vision of the collective because the popular sectors, without the backing of the State, won’t be able to do this.” Well, we’re going to try to combine things so it can work, but we don’t want to keep converting the public into the ‘state’. Nancy Fraser wrote an article on the triple movement – looking at Polanyi’s work on the ‘double movement’ in the Great Transformation, that is the movement towards mercantilisation, and the opposite movement it stimulated towards protection. Polanyi talks about the confrontation of these 2 movements in the early 20th century, and the State – in its soviet form or in its fascist form – as a protectionist response of society which demands protection when faced with the uncertainty, the fragility the double movement engenders. Nancy Fraser says that all that is true, but we’re no longer in the 20th century, we’re in the 21st century where factors like individual emancipation, diversity, feminism are all very important – so we shouldn’t be in favour of a protectionist movement that continues to be patriarchal and hierarchical. We need a movement for protection that generates autonomy – and there resides what I think is one of the keys of the Commons movement. The idea of being able to get protection – so, a capacity of reaction against the dynamics of the market attacks – without losing the strength of diversity, of personal emancipation, of feminism, the non-hierarchical, the non-patriarchal, the idea that somebody decide for me what I need to do and how I will be protected. Let me self-protect myself too, let me be a protagonist too of this protection. And this is contradictory with the state-centric tradition. JS — In some aspects no. For example, the city wanted to open a new contract for communications (telephone, internet) – now there are the big companies Telefonica, Movistar, Vodafone, Orange, etc: there’s a cooperative called ‘Som Connexion’ (We are connection)- or ‘Som Energia’ (We are energy) that’s a lot bigger – it has 40,000 members – but these cooperatives, it would be fantastic if the city were to give them the contract for energy or for communication, but they aren’t capable of managing that at the moment. So if they take it, we’d all have big problems: faulty connections, lack of electrical power – because they’re growing for sure but they don’t yet have the ‘muscle’, the capacity they need to take this on. So we have to continue investing in this, it’s not going to take care of itself. On the other hand, in other areas, like home services for the elderly, we do have very strong cooperatives, Abacus for example is a cooperative for book distribution that has 800 000 members, so that is a coop that’s very powerful, and there are others. But in general, the more powerful the coop, the less politicised it is – they tend to transform themselves into big service companies. But now they are understanding that perhaps it would be in their interest to have a different vision; there has been a very politicised movement in the grassroots level coops that is contradictory with the entrepreneurial trend in the big coops. So we’re in this process right now: yes, there are very big, very strong coops and there are also smaller, more political ones but they don’t have sufficient muscle yet. AA — When we look at issues of participation, co-production of policy and such, it is also a question of culture, a culture of co-production that doesn’t exist. In the neighbourhoods, yes there is a trend to revamping participation, but when we talk to people in the local-level committees they say ‘Sure, people come to the meetings, but because they want a tree planted here…’ and they don’t have that vision of co-creation. So first there has to be a sort of cultural revolution ? JS — There are places where there has been a stronger community tradition that could well converge with this. Some neighbourhoods like Roquetes for example, Barceloneta or Sants, have very strong associational traditions. If you go to Roquetes to the meeting of the community plan, everybody is there: the people from the primary medical services centre, the doctors, the schools are there, the local police, the social workers – and they hold meetings every 2 weeks and they know everything that goes on in the area, and they transfer cases amongst themselves: “we detected this case, how do we deal with it?” etc. The community fabric in those neighbourhoods functions really well. So what can you add to that fabric so that it can go a bit further? On the other hand, in other neighbourhoods like Ciutat Meridiana, in 5 years 50% of the population has changed, so it’s very difficult to create community where the level of expulsion or change is so high. In Sants, in Ca Batlló, there was a very interesting experience where people want to create a cooperative neighbourhood – it’s a bit polemical – they want to create a public school without using public funds, instead using money from the participants themselves, because the coop tradition in Sants is very anarchist, libertarian – so they promote the idea of a public school, open to all, but not using public funds. And it would have its own educational philosophy, that wouldn’t have to submit to standard educational discipline. And groups have appeared in different neighbourhoods dedicated to shared child-raising where there are no pre-schools for children between 0 and 3 years, or people prefer not to take the kids to public pre-schools because they find them too rigid, so they prefer generating relationships amongst parents. So what should the role of the city government be with respect to such initiatives? Should it facilitate or not? There’s a debate about how to position the municipality with respect to these initiatives that are interesting but then when, inside Barcelona en Comú or Catalunya en Comú, the person who is in charge of these issues comes with a more traditional union perspective and says “This is crazy, what we need to do is to create public schools with teachers who are professional civil servants. These experiments are fine for gentrified zones, but in reality…’” And they are partly right. So we’re in that sort of situation, which is a bit ambivalent. We’re conscious that we need to go beyond a state-centric approach, but at the same time we need to be very conscious that if we don’t reinforce the institutional role, the social fragilities are very acute. JS — Exactly: it’s plural, in lower case and plural: sovereignties. The idea is a bit like what I said earlier about the city, that we want to take back the city. We want to recover the collective capacity to decide over what affects us. So it’s fine to talk about the sovereignty of Catalonia, but we also need to talk about digital sovereignty, water sovereignty, energy sovereignty, housing sovereignty – sovereignty in the sense of the capacity to decide over that which affects us. So we don’t have to wait until we have sovereignty over Catalonia in order to grapple with all this. And this has obvious effects: for example, something we are trying to develop here: a transit card that would be valid on all forms of public transit – like the “Oyster” in London, and many other cities have them – an electronic card that you can use for the train, the metro, the bus: the first thing the Barcelona city government did on this was to ask the question “Who will own the data? “. That’s sovereignty. The entity that controls the data on who moves and how in metropolitan Barcelona has an incredible stock of information with a clear commercial value. So will it belong to the company that incorporates the technology? or will the data belong to the municipality and the municipality will do with it what it needs? At the moment, they are installing digital electricity metres and digital water metres: but to whom do the data belong? because these are public concessions, concessions to enterprises in order that they provide a public service – so who owns the data? This is a central issue. And it is raised in many other aspects, like food sovereignty. So, we want to ensure that in the future Barcelona be less dependent on the exterior for its food needs, as far as possible. So you need to work to obtain local foodstuffs, control over the products that enter – and that implies food sovereignty, it implies discussing all this. So, without saying that the sovereignty of Catalonia isn’t important, we need to discuss the other sovereignties. Because, suppose we attain the sovereignty of Catalonia as an independent state, but we are still highly dependent in all the other areas. We need to confront this. I don’t think it’s a way of avoiding the issue, it’s a way of making it more complex, of understanding that today the Westphalian concept of State sovereignty no longer makes much sense. I think we all agree on that. We are very interdependent, so how do we choose our interdependencies? That would be real sovereignty, not to be independent because that’s impossible, but rather how to better choose your interdependencies so that they have a more public content. AA — Talking of interdependence, there is the issue as well of internationalism. Barcelona en Comú puts a lot of emphasis on that, saying ‘There is no municipalism without internationalism’ etc. From the very outset of her mandate, Ada Colau in 2015 in her inaugural speech as mayor said that ‘we will work to build a movement of cities of the Mediterranean’, and as time goes on the approach is becoming clearer, for example with the participation of Colau and the vice-mayor Gerardo Pisarello in the major international city conferences. What do you see as the importance of this internationalism within the Commons ecosystem? JS — There are 2 key aspects for me. First, cities are clearly the most global political space and zone of social convergence that exists. Apparently when we talk about cities we’re talking about something local, but cities are actually very globalised. Benjamin Barber wrote a book about ‘Why Mayors should govern the world’. And he set out an example I think is very good: if the mayor of Montreal meets with Ada and the mayor of Nairobi and the mayor of Santiago de Chile and the mayor of say Hong-Kong, after 5 minutes together they’ll all be talking about the same things. Because the problems of cities are very similar from one place to another despite their different sizes. Questions of energy, transport, water, services, food… If we try to imagine that same meeting between Heads of State, the complexity of the political systems, cultural traditions, constitutional models and all will mean that the challenge of coming to a common understanding will be much more complex. That doesn’t mean that cities are the actors that will resolve climate change, but certainly the fact that Oslo, Copenhagen, Amsterdam, Barcelona and Paris agree that in 2025 there will no longer be cars circulating that use diesel will have more impact than a meeting of Heads of State. With AirBnB Barcelona is in constant confrontation, the city has fined them 600,000 euros, but Barcelona on its own can’t combat AirBnB. But New York, Paris, London, Amsterdam and Barcelona have come to an agreement to negotiate jointly with AirBnb: those 5 cities together can negotiate with them. But it isn’t the problem for States, it’s much more a problem for cities than for States. And AirBnB uses digital change to enter spaces where there is a lack of precision – it’s what happens too with Uber, Deliveroo and other platforms of so-called ‘collaborative economy’, which is really extractive economy, but which use the reglamentary voids. The people who work for Uber or Deliveroo aren’t employees, they are independent entrepreneurs but they work in 19th century conditions. Tackling this problem from the level of the city can produce new solutions. I think when we decided in 2014-2015 to attempt to work at the municipal level in Barcelona, we were aware that Barcelona isn’t just any city: Barcelona has an international presence and we wanted to use Barcelona’s international character to exert an influence on urban issues worldwide. Ada Colau participated in the Habitat conference in Quito in October 2016, before that in the meeting of local authorities in Bogota, she is now co-president of the World Union of Municipalities. So there’s an investment that didn’t start just with us but that started in the period when Maragall was mayor, a very high investment by Barcelona in participating in this international sphere of cities. This reinforces Barcelona in its confrontations with the State and with private enterprise as well. It plays an important role. There is an international commission within Barcelona en Comú, they are constantly working with other world cities – they have been in France, they have a strong link with Grenoble and will be going to a meeting of French cities in September to talk about potential collaboration, they often go to Italy, they’ve gone to Belgrade, to Poland. In June they’re organising a meeting of Fearless Cities, with the participation of many mayors from major cities in Europe and around the world. So there is a very clear vision of the global aspect. So the global dimension is very present, and at the level of Spain as well. The problem there is that there is political interference, for example in Madrid, which is very important as a city, but within the municipal group “Ahora Madrid” they’re very internally divided, so sometimes you speak to one and the others don’t like it. We have really good relations with Galicia: A Coruña and Santiago de Compostela, also with Valencia, but Valencia also has its own dynamic. Zaragoza. Each city has its own dynamic, so sometimes it’s complicated to establish on-going relations. AA — What about Cadiz? JS — Of course, Cadiz is also part of this trend, but the group there is part of the Podemos anti-capitalist faction, so there are nuances. JS — Yes, first there was the general global perspective on cities and the second is Barcelona’s own concrete interest. So the first is more global, that is, any city in the world today has many more possibilities if it looks at its strategic global role and if it wants to strengthen its position, it has to work on the global level. In the case of Barcelona specifically, there is also a will that’s partly traditional, because it was begun by Maragall, you have to remember that here in Barcelona there are 10 districts, and during the war of the Balkans, Maragall created District 11, which was Sarajevo: city technicians went to Sarajevo to work with them, and still today there are municipal technicians who travel regularly to Gaza to work there, or with La Havana – in other words there’s a clearly established internationalist stance in the municipality. Also, the headquarters of the World Union of Local Governments is in Barcelona. The international headquarters of Educating Cities is in Barcelona, so there has constantly been a will to be present on the international scene since Maragall, and now this is continuing but with a new orientation as well. Perhaps there used to be the idea of exporting the Barcelona model, branding Barcelona, but that is no longer the case. There’s very intense organisation globally, probably if Ada accepted all the invitations she receives, she’d be travelling all the time. AA — Coming back to the issue of sovereignty vs independence and “the right to decide”, how does this play out? this requires the construction of a State of its own. It is on the fourth point that we are not in agreement: whether that State should be independent or whether it should be in some way linked, allied, confederated with the rest of the Iberian Peninsula or with Europe. These 3 initial points are sufficiently important and they are the basis for the fact that Catalunya en Comú or Barcelona en Comú is part of the broad sovereigntist space in Catalonia. What it isn’t part of is the independentist space in Catalonia. Despite the fact that I would say some 30-40% of the members are pro-independence, but the rest not. And that is an issue which divides us. But what we are trying to do is to work out this debate on the basis of our own criteria, not on those of other movements. The criteria of the others are ‘you are independentist or you are not independentist’. Our own criteria are: yes, we are sovereigntists, we discuss sovereignties and we’ll see. Since we agree on what is the most important (that is – an autonomous political subject, the right to decide, an autonomous State), let’s discuss how we can articulate. We have fraternal relations with 4 million people in the rest of Spain who agree with us on the first 3 criteria. So the key question probably would be: Does Catalonia want to separate from the rest of Spain or from this Spain? The standard response would be “We have never known any other. We’ve always seen the same Spain, so there is no other Spain”. So the debate we can have is over “Yes, another Spain is possible”. Sort of like the debate right now over whether to leave Europe: do we want to leave Europe or leave this Europe? But is another Europe possible or not? NT — I am struck by the fact that every time we refer to the initiative of Catalunya en Comú, you respond by giving the example of what’s happening in Barcelona: do you see Barcelona as the model for Un Pais en Comú? JS — No, it’s not that it’s the model, there is even some reticence within Barcelona en Comú that this new political initiative may have negative consequences for Barcelona en Comú. The Barcelona in Comú experiment has worked really well: within BeC political parties continue to exist (Podemos, Iniciativa, EUIA, Guanyem) and all agree that it’s necessary to create this subject, because it’s clear – there’s a phrase by a former mayor of Vitoria in the Basque country who said “Where my capacities end, my responsibilities begin” – that is, clearly, cities are developing roles that are more and more important, but their capacities continue to be very limited and especially their resources are very limited – so there’s an imbalance between capacities and responsibilities. Between what cities could potentially do and what they really can do. Refuge-cities – a thousand things. So within Barcelona en Comú there is an understanding of the interest of creating Catalunya en Comú in order to have influence in other levels of government. And to present candidates in elections in Spain with En Comú Podem because to be represented in Madrid is also important. But of course, sometimes this expansion can make us lose the most original aspect, that is the emphasis on municipalism, in the capacity to create these spaces – so there’s a certain tension. And obviously, when you go outside Barcelona in Catalonia, the local and territorial realities are very different, you find… you no longer control what kind of people are joining and so you can end up with surprises – good and bad ones – so there are some doubts, some growing pains. You have to grow, but how will that affect what we have so far? our ways of working and all that… I always refer to Barcelona en Comú because we have existed for longer, we have a sort of ‘tradition’ in the way we work, and on the contrary, the other day we held the founding assembly of Catalunya en Comú and – where are we headed? how long will we be able to maintain the freshness, avoid falling into the traditional vices of political parties? Xavi (Domenech) is a very good candidate, he has what I call a Guanyem DNA, but it’s not evident that we can pull this through. That’s the doubt. NT — How do you assess the results of the founding assembly of Catalunya en Comú? Are you happy with what came out of it? JS — Yes, I’m satisfied, although I don’t think the results were optimal, but we are squeezed by a political calendar that we don’t control. It’s very probable that there will be elections this year in Catalonia, so if that happens… what would have been preferable? To reproduce the Barcelona en Comú model, take more time and work more from the bottom up, hold meetings throughout the territory – we did hold about 70 or 80, but a lot more would have been better – do things more slowly and look around, build links with local movements, the same ones as in Barcelona but on the level of Catalonia – energy, water, etc: reconstruct the same process. But sure, they’re going to call elections or a referendum in 2 days. What is clear is that we can’t do the same thing as with ‘Catalunya si que es pot’, which was a coalition but it didn’t work. So all this has meant that the process – despite the fact that I think it has been carried out well, is not optimal: within the realm of the possible, I think it was done with great dignity. NT — And with respect to the deliberative process that was used to arrive at the final document? JS — Basically the same thing: it could have been done better, with deeper debates in each area, it was done very quickly, a lot of issues in a short period of time. The task was very complex, and I think the result is worthy. We tried to avoid standardised jargon and parameters, to make it a bit different. So now we’ll see – yesterday the Executive met for the first time, and on May 13 will be the first meeting of the coordinating group of 120 people. So we’ll have to see how this all is gotten underway. I am not convinced that it will all be functional in time for the Catalan elections, for me the key date is May 2019 which are the next municipal elections. Then we’ll see if this has really jelled and if we can have a significant presence throughout the territory. This territorial vision is very important in order to avoid a top-down construction. The key thing in Catalonia is to do it with dignity and not to become entrapped in this dual logic of independence or not, to be capable of bringing together a social force that is in that position. ↑ Autonomous elections are those held in the 17 Autonomous Communities of Spain created by the 1978 Constitution. Catalunya is one of them. ↑ The Unified Socialist Party of Catalonia or PSUC: Founded in 1936, it allied the main parties of the Catalan left around the Communist Party. It was dissolved in 1987. ↑ “A country in common”. The process, carried out in a transparent and well-documented manner, began with a negotiation with certain left-wing parties and movements, and encouraged discussion and new proposals at popular assemblies throughout the region and in online discussion open to the public. More than 3,000 people participated in 70 assemblies and more than 1,700 proposals and amendments were made online with the webpage registering nearly 130,000 hits. The Assembly discussed and voted on the various amendments and agreed on a transitional structure composed of a coordinating body of 120 members and an executive committee of 33 members, each with a one-year mandate to propose an ethical code, statutes, an organizational structure and political options in the unfolding conjuncture. ↑ “La Politica de Comù” in Nous horitzons (New Horizons) No. 215, 2017. Originally titled Horitzons, the magazine was founded in 1960 in clandestinity and published in Catalan abroad by intellectuals linked to the PSUC. It has been published in Catalonia since 1972. It recently opened its pages to other progressive political tendencies. ↑ Albano Dante Fachin, member of the Catalan parliament, is the head of Podem (the Catalan wing of the Podemos party). He opposed the participation of his party in the constituent assembly of Un Pais en Comù thus creating a crisis in the ranks of Podemos at both the Catalan and national levels. Party leader Pablo Iglesias did not disown him, but delegated his national second-in-command Pablo Echenique to represent him in the assembly. ↑ Coalitions of the Catalan left since the transition period of the 1970s have been numerous and complex for the uninitiated. “Iniciativa for Catalonia Verts” dates from 1995 and was composed of the Green party with Iniciativa for Catalonia, itself a 1987 coalition of the left parties around the PSUC and the former Catalan Communist Party. EUIA (United and Alternative Left) is another coalition in 1998 which includes the first two and all the small parties of the radical left. EUIA is the Catalan branch of Izquierda Unida (United Left) the new name of the Spanish Communist Party. ↑ Pasqual Maragall, member and later president of the Catalan Socialist Party, became mayor of Barcelona in 1982 with the support of the elected members of the Unified Socialist Party of Catalonia (PSUC). He remained in this position for almost 15 years without ever having a majority in the municipal council. He then became President of the Catalan government in 2003. ↑ Catalunya Sí que es Pot (CSQP, “Yes Catalonia Is Possible”) is a left-wing coalition created in view of the Catalan elections in the autumn of 2015. Barcelona en Comù, itself a municipal coalition, was elected in May 2015 but decided not to run in the autonomous elections. ↑ The election result was no surprise: ‘A country in common’ founder Xavier Domenech will preside the Executive Committee and Ada Colau, the current mayor of Barcelona, is president of the coordinating body. The membership, via an internet vote, chose on May 20 a new name preferring “Catalunya en Comù” to “En Comú podem”, thus distinguishing itself from the 2015 Catalan coalition with Podemos, also called “En comu podem” and signalling a reinforcement of the “Barcelona en Comù” wing with respect to the supporters of Podemos in the new entity. The rejection of the earlier name ‘Un Pais en Comu’ may also denote a desire to distance itself from a pro-independence stance. Originally published on remixthecommons.org, where the interview is also available in French. This Summer, Build the Next Internet! ← This Summer, Build the Next Internet! Remix The Commons is an intercultural space for sharing and co-creating multimedia documents about the commons. The project is hosted by an intercultural collective of people and organizations convinced that the curation, exchange and remixing of diverse narratives, definitions and images of the commons are a dynamic and participatory way of appropriating and disseminating the concept of the commons.